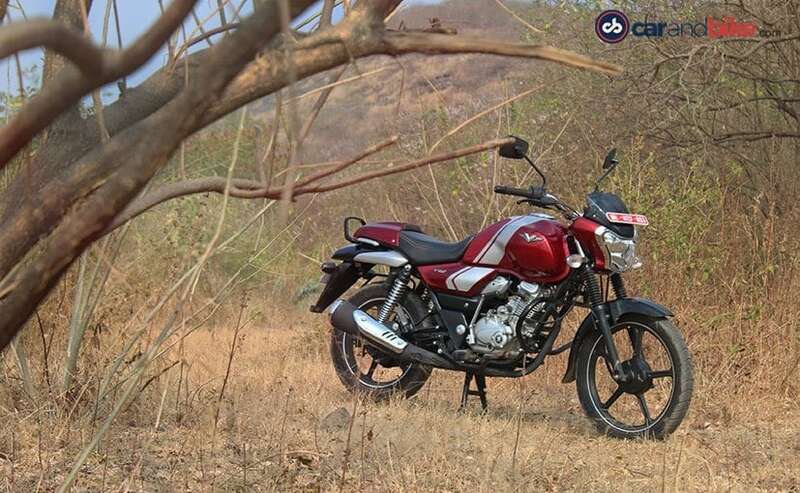 The Bajaj V15 was Bajaj Auto's answer to the 125 cc and 150 cc executive motorcycle category. The V15 was intended to be a larger bike for the price of a 125 cc offering and build volumes for the automaker in the process. While the V brand has certainly built quite a name, the sales figures have been positive at around 20,000 units every month, they aren't overwhelming. That's a reason why the Bajaj V12 has arrived a year after the V15's launch as a more efficient and value for money motorcycle, expanding on the same premium brand image that the V15 has created. But does the V12 really make the cut? 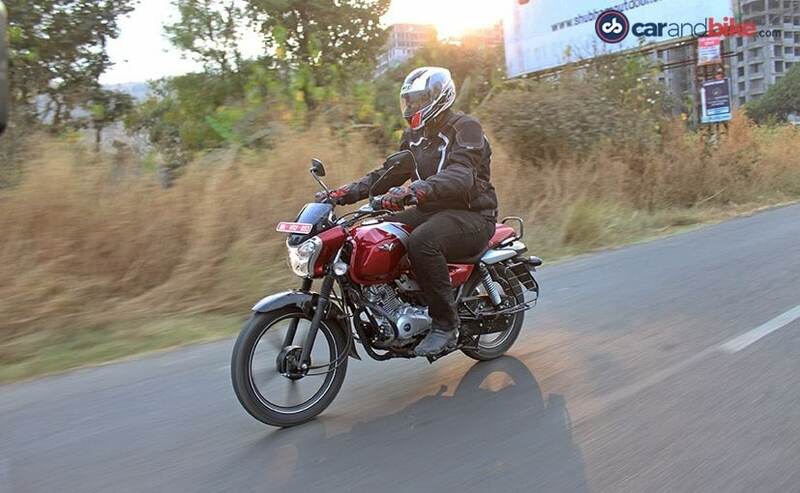 We take to the saddle of Bajaj's latest commuter to see what it is all about. 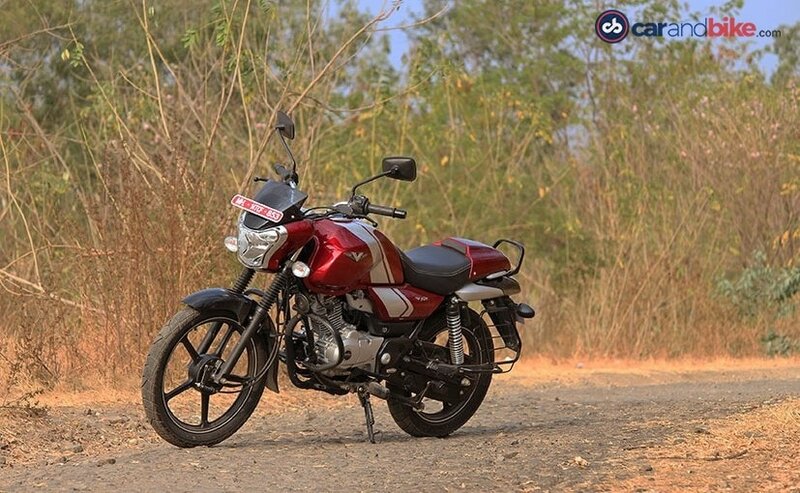 The Bajaj V15 managed to break the conventional mould in which commuter motorcycles have been designed. The V15 is not only stylish but unique as well and Bajaj has retained these bits on the V12. While both models look extremely identical with the same design architecture and chassis, you will see subtle differences between the two. The fuel tank continues to remain one of the more prominent bits, but the tank stripe now continues to the side panel in a line. The V12 gets a black painted front mudguard, which is body coloured on the V15, while the grab rail is now standard. The removable rear seat cowl has also been retained keeping the styling on point. Given the cost concerns, Bajaj has made some minor changes to the V12. The aluminium ring around the ignition is replaced with a plastic one, while the rear foot rest holder is now made of fabricated steel instead of an all-aluminium unit. The V12 also gets slimmer 30 mm front telescopic forks replacing the 33 mm units on the V15 and is covered with fork boots for an all-black look. The bike comes with lighter 5-spoke alloys that replace the split-alloys of the V15 and the front tyre is narrower with a 90/90 R18 unit doing duty. The rear gets a 100/90 16-inch wheel, which is also the widest in its segment. Both tyres are tube type. Coming to paint options, Bajaj is offering the V12 in two dual-tone colour schemes. The red and silver shade is eye-catching and manages to stand out amidst the clutter, while the new black and orange shade is unique to the bike. The paint quality is impeccable and something that gets your attention at first sight. The overall fit and finish too are on par with the competition. Bajaj tells us that the blue and silver shade from the V15 will also make it to the V12 but at a later date. Another casualty of the cost concerns is the instrument cluster that now gets an analogue fuel gauge instead of the trendy LED bars. The fairly simple unit is easy to read but the font size could have been a tad bit bigger and takes some effort. The V12 also comes with the INS Vikrant insignia on the fuel tank, a gentle reminder of its strong roots. At the heart of the V12 is a newly developed 124.45 cc engine. This motor, Bajaj tells us comes from the V family, but gets several new components internally. The bore is now smaller, while the stroke remains nearly identical to the V15 and is one of the longest in its class, making for ample torque. So the torque inclined mill churns out 10.5 bhp at 7500 rpm and a segment-leading 11 Nm that kicks in at 5500 rpm. The motor is paired to a 5-speed gearbox, which makes it the only one in the segment and is easy to use courtesy of the light clutch. Given the city friendly duties of the motorcycle, the torque really works as a boon here. Bajaj has specifically worked on making power more accessible initially in the rev band, which makes for a negligible top end. But, there is an abundant lower grunt and the bike pulls offline sans any drama. Speeds build quickly and the V12 feels eager upshift and stay there for the most part. You can pull from 30 kmph all the way up to 70 kmph in fifth gear and the strong mid-range ensures you can hop around the city all day at speeds between 40-60 kmph with absolute ease. What we also like is the exhaust note on the V12 that has a prominent bass to it. The note is similar to that of the big V and is easily distinguishable when compared to other 125 cc commuters out there. 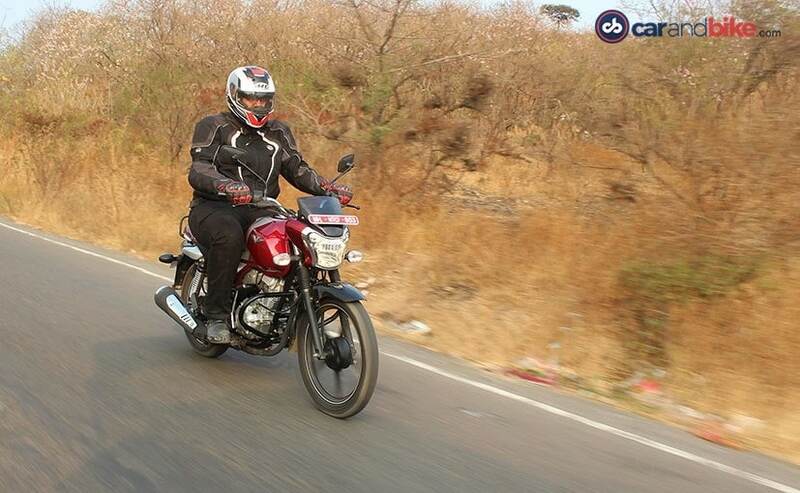 The refinement levels are impressive on the Bajaj V12 and are even better than that of the V15's. In fact, Bajaj has also made changes to the 2017 V15 for similar refinement. The linear power delivery ensures you hit speeds up to 70-75 kmph with no issues. Those with a lighter belly will be able to push the bike over 80 kmph. However, that's where the absence of a top-end sets the limiter and vibrations creep at the handlebars, foot pegs as well as the seat. It's between 60-70 kph though that the bike feels in its flavour. The V12 gets the same 5-speed gearbox as the V15, albeit the shifter has been tuned to handle the torquey nature of the mill. You get the same heel and toe unit with the 'all-up shift' pattern that does take some time to get used to. While shifting is easy, the gearbox could have been more precise and we did encounter false neutral on several occasions. 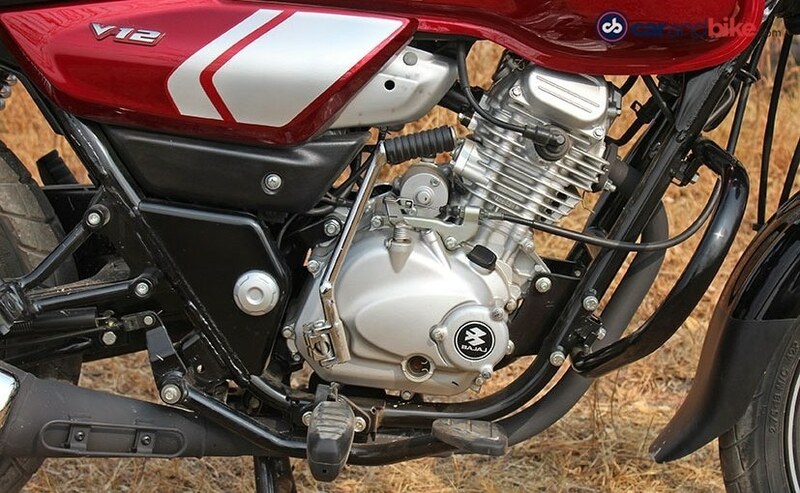 The Bajaj V12 uses the same single downtube frame as the V15, but, the bike uses thinner forks up front and gas charged twin shock absorbers at the rear. The suspension has been tuned to offer a plush ride quality and definitely scores full marks in that regard. 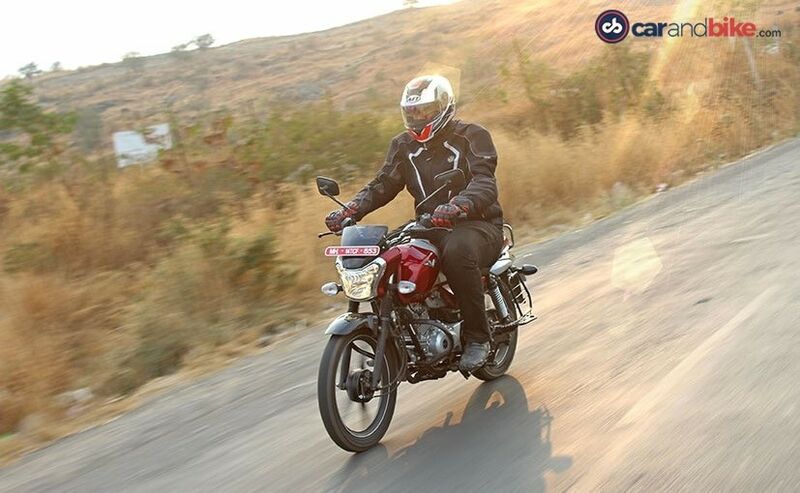 Uneven roads are transmitted at a minimum to the rider who sits in an upright position and the bike does a good job in ironing out any undulations. 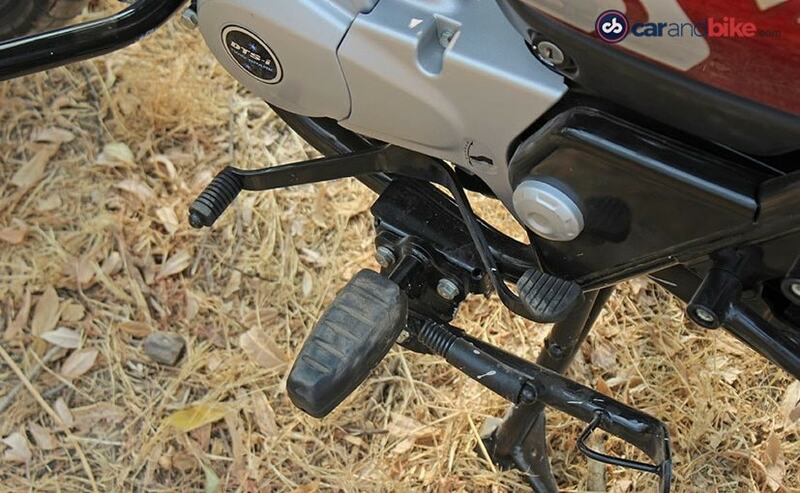 Even with a pillion, the suspension does not bottom out and will take the additional weight with ease. 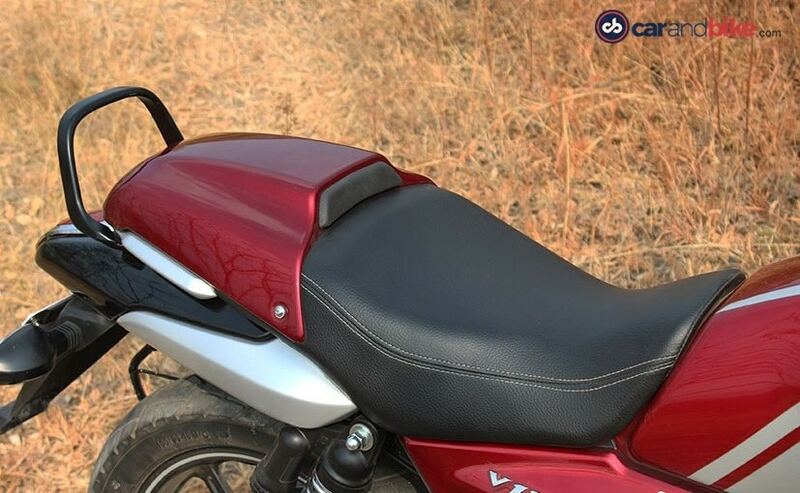 Special mention also goes the well-cushioned seat that aids to the overall pliant ride. It's only at high speeds that you feel the thumps and thuds. The softer suspension setup makes the Bajaj V12 little overwhelming around corners and the bike feels too enthusiastic but not in a negative way. That, coupled with the wide handlebar actually makes this 125 commuter a little bit more fun but does take some time to get used to. Unlike the V15 that rides on Ceats, the V12 uses MRF Kurve tyres that manage to offer better feedback on the tarmac. While the ride quality is certainly something to take note of, the brakes sadly aren't. 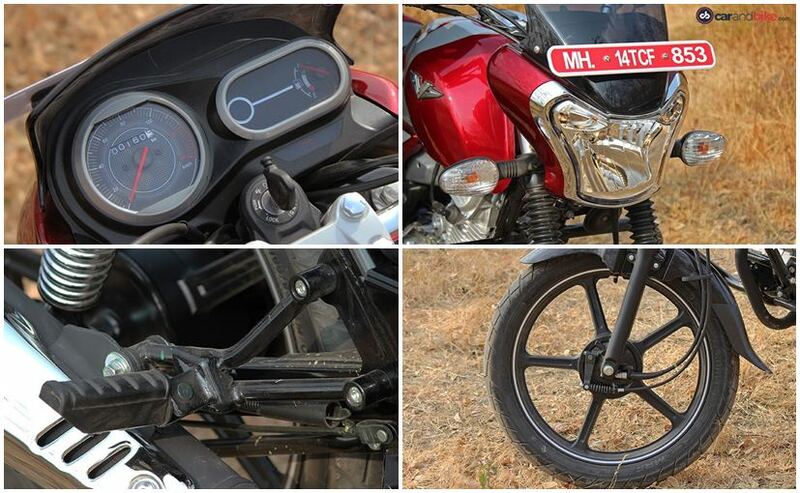 Bajaj has opted to go for a dual 130 mm drum brake setup, and the front disc is sorely missed. The brake lacks bite and isn't as confidence inspiring as I had hoped. The rear does its job adequately, but overall I would've liked more feedback from it. Bajaj too acknowledges this has said that given the demand, it could introduce a front disc brake as optional at a marginal premium. 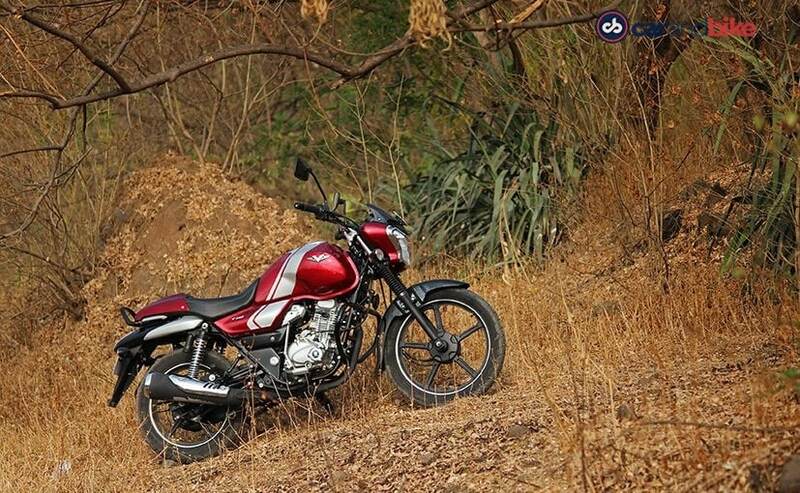 The Bajaj V12 is built on a strong name that the V15 created for itself in the past year. What really works in favour of the V12 is the design similarity, which largely has been the biggest draw for customers towards brand V, and also one of the reasons I believe makes the bike appeal to a wide audience. It could be your first bike or your fifteenth it wouldn't matter. Priced at ₹ 56,283 (ex-showroom, Delhi) the V12 will charm you the same way as the V15 did, but for a good ₹ 6000 less. What you miss out on are subtle styling difference, 2 bhp of lesser power and even better braking. But as far as value for money is concerned, the V12 - like its motor - is off to an easy start. And that might as well be the reason a major chunk of buyers will be flocking at Bajaj dealerships soon.